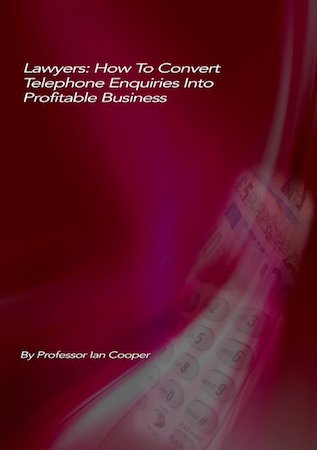 ‘Lawyers: How To Convert Telephone Enquiries Into Profitable Business’, is the only book on this subject in the world exclusively for lawyers. It contains a huge number of thought provoking practical, easy to implement techniques, strategies and tips on exactly what you need to do to turn more of your telephone enquiries into profitable business. It includes easy to use tools, simple solutions and suggestions for all strategic issues relating to dealing with telephone enquiries, plus it will give you the tried and tested, 5 Step Structure that has dramatically increased results for many, many firms. Reading this book and adopting some of the strategies is the quickest, cheapest and most guaranteed way to generate profitable new business into your firm? GUARANTEE – If you don’t find this book useful, you can have your money back. The cost of the ebook is just £27 + VAT. You can pay by credit/debit card or PayPal and get an immediate download. How to create your strategy for enquiry handling. The ‘5 Step Conversion Process’ for turning an enquiry into profitable business. Quantifying the potential. The financial importance of the enquiry. The ‘10 commandments’ of winning business over the telephone. How to get the caller to want your firm, even if you are more expensive. How to deal with the ‘how much’ question. Most firms fall into the price trap. What is it and how to avoid it? How to give your fees and talk money. How to build rapport with the caller. Personalising the call and making it more than an administrative process. Getting the front line basics right. How to end the call and ask for the business, without being pushy. Who should handle the calls? – Getting the batting order right. Time to properly understand the call handler’s role. What are the magic questions that most enquiry handlers fail to ask? Should you offer free appointments / consultations or not? How to time control the call, so you don’t just become a ‘free advice line’. How to overcome bad call handling habits and replace them with good ones. The importance of tracking results information and how to do it. How to implement the key recommendations. Professor Ian Cooper is one of the most experienced specialist business development consultants and skills trainers for the legal profession in the world. He has helped over 850 law firms of all sizes increase their business over a period of 30 years. He is an international business author and speaker, who has written 16 books, is translated into 13 languages, published in 55 countries. His most recent book, the The Financial Times Guide To Business Development: How To Win Profitable Customers and Clients’, was shortlisted for the best business / management book of the year award last year. —Jonathan Lilley, Managing Partner, Blaser Mills Solicitors. “The conveyancing department were averaging around 15% – 20% as a conversion rate for new enquiries. After enlisting the help of Ian with regards to conversions, 2 months later, the department was averaging 70% – 75% conversion rate throughout the year”. Pay to download your full copy now! Pay by debit/credit card or PayPal and get an immediate download. Just click on the PayPal button below.